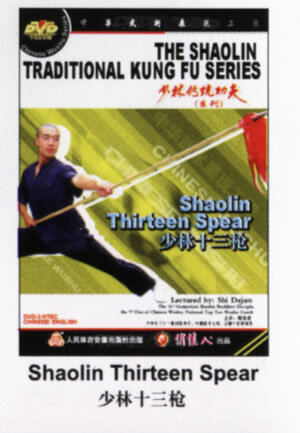 Shaolin Thirteen Spear is one of the spear plays in Shaolin, its structure is complete and its frame is special. In this spear, there are thirteen movements for thrusting by spear, so we called it thirteen spear. Spear belongs the long weapon, and it is called the king of ancient weapons. It's the most difficult weapon for practicing, especially to get to the high boundary. It's said: "one month's practice for practice for the broadsword, one year's practice for cudgel, and thousands days for the spear. " So we can see the difficulty of exercising spear. The routine of Shaolin Thirteen Spear consists of the methods such as outer parrying, inner parrying, thrusting, chopping, flicking, hooking, picking, piercing, blocking and figure circling, etc.